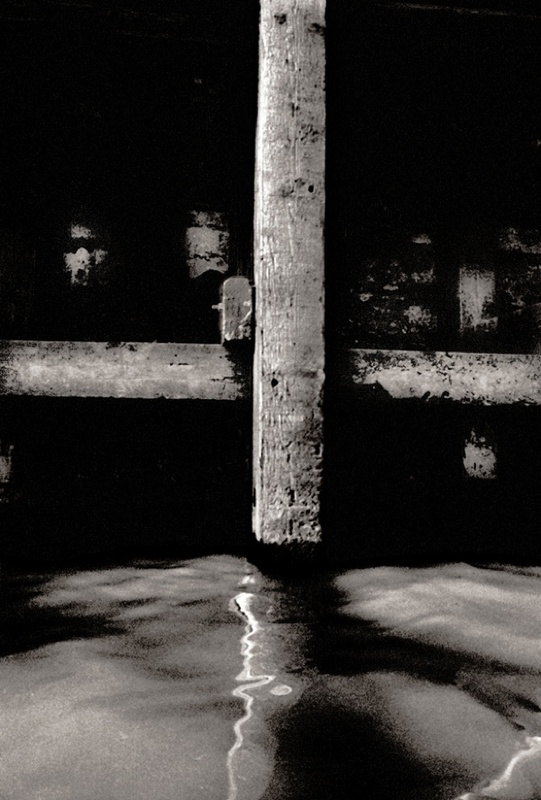 These atmospheric photographs of the Thames by John Claridge – published here for the first time – offer a poignant vision of the working river that was once a defining element of the East End. Within living memory, the busiest port in the world was here yet today barely a trace of it remains. 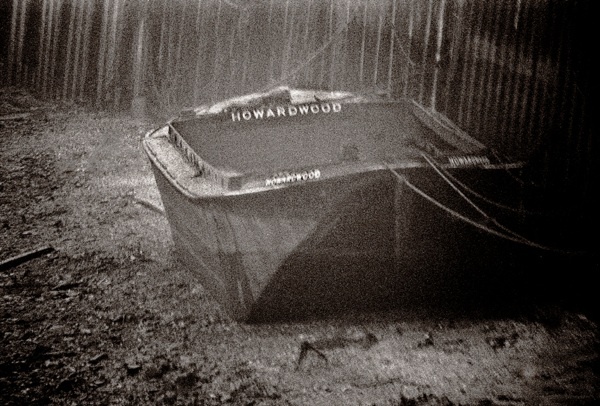 And John’s pictures, mostly taken when he was a mere kid photographer, capture the last glimmers of the living docks.“My dad’s friends were saying that the docks were going down, so I was aware of that and I just wanted to grab hold of it,” John told me. As a youngster, John was able to get everywhere, creeping through side alleys, climbing over walls, even setting out in a tiny inflatable dinghy on the river, but sometimes, he would just walk right in through the main entrance.“I’d go through the dock gate,” he confessed, “It was much more of an innocent time – I should have got a pass, but I’d just say, ‘I’m doing photographs’ and they’d say, ‘On you go.’ As a kid you could get anywhere.” If you observe the shifting point of view in these pictures, you can see that some are taken from the Thames beach, some from John’s dinghy at water level while others are taken looking down from walls and bridges, where he had climbed up. 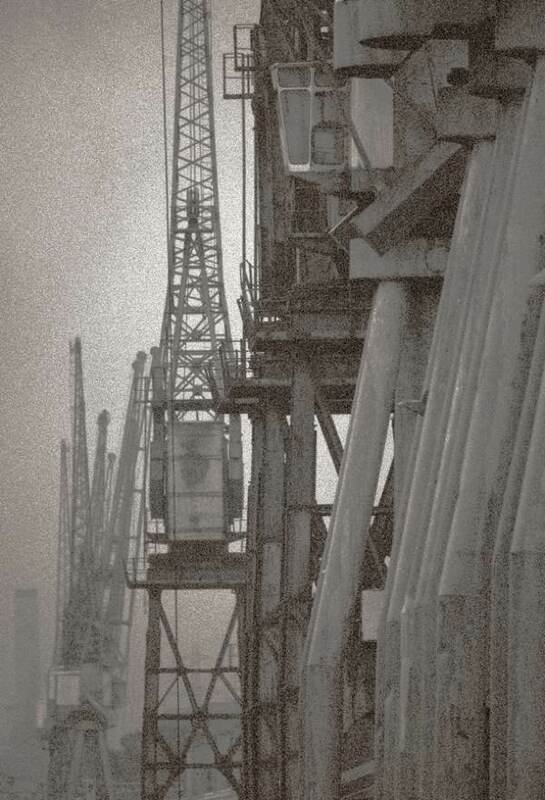 The majestic image above was taken in the dawn light in Silvertown in 1964, when John climbed onto the dock wall to photograph the huge cargo ship that had just arrived, and waited for the sun to rise before he took his picture. As a consequence, the vessel filling the background looks like a phantom fading in the first light of day. 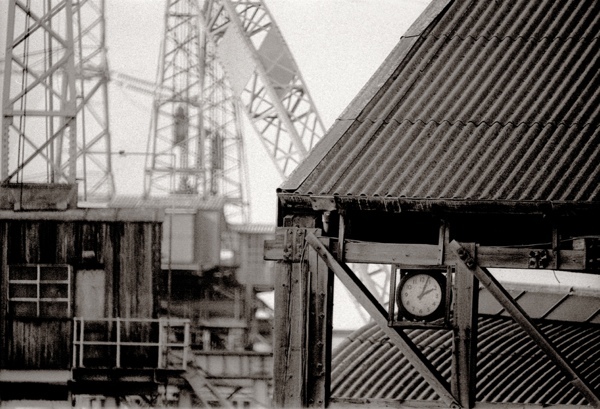 There is an equally fascinating distinction between the foreground and background in the photograph below, also taken over the dock wall in Silvertown in 1964. The ships in the background appear ethereal as if they were a mirage too, about to vanish. 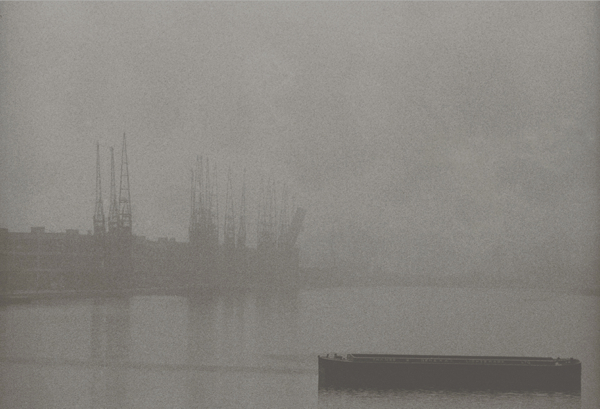 In John’s vision, the docks are haunted by their own disappearance, and the incandescent dreamlike ambiance of his pictures – often taken through fog or mist rising from the river – places them in a pictorial tradition of the Thames which includes Whistler and Turner. Old warehouses in Silvertown, 1982. 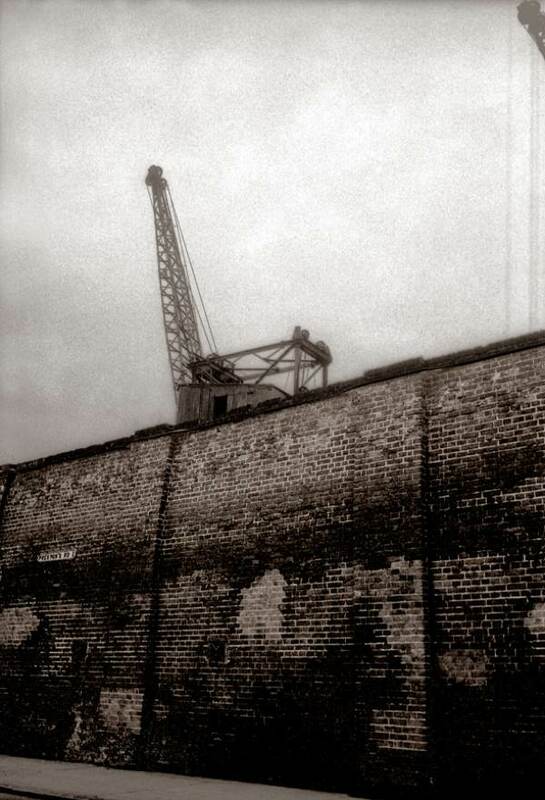 Dock wall, Isle of Dogs, 1982. 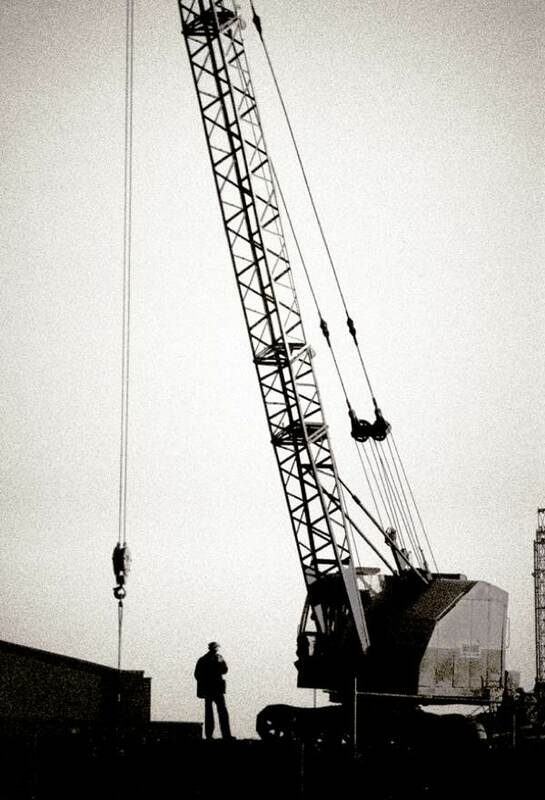 1962, a crane driver takes a break for a fag in Silvertown. Near Stratford, from road bridge with the canal in the foregound, 1960. 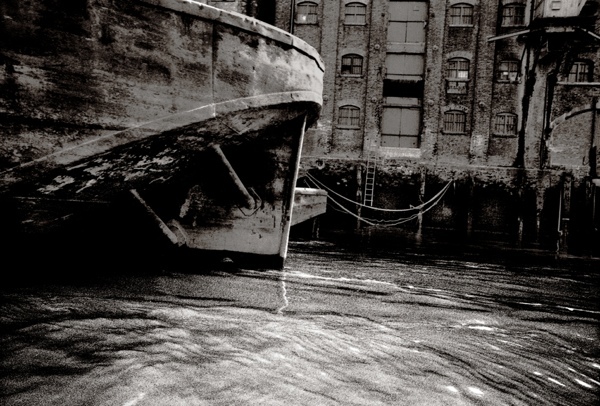 At water level, Wapping, 1964. 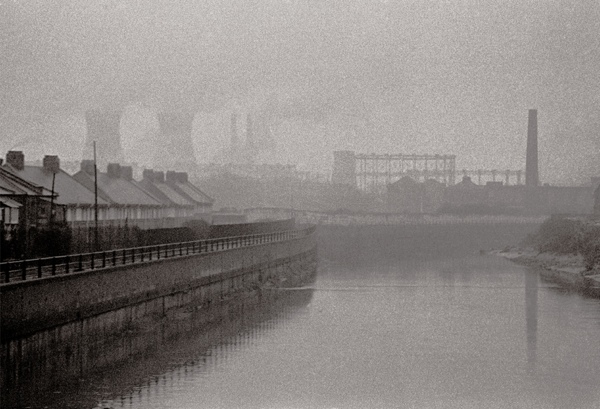 Chemical works near Bow, 1965. 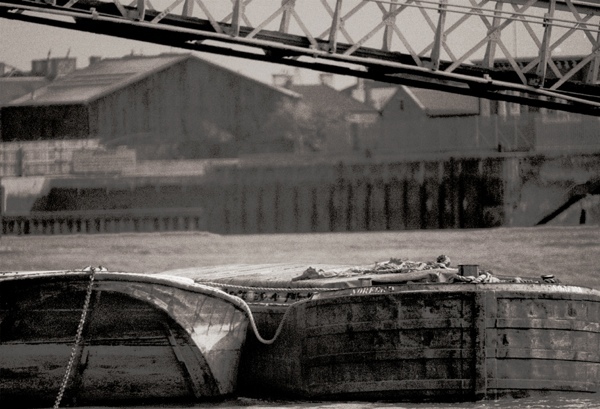 Near Silvertown, with one of the bridges across the dock in the background, 1966. A lighter in Wapping, 1961. These are utterly amazing. If only we could find a photographer to do the same for Mistley Quay and Harwich docks…. These are wonderful. I remember walking round the dock area in the sixties, never dreaming that it would all go. Glad I saw it while it was still there. 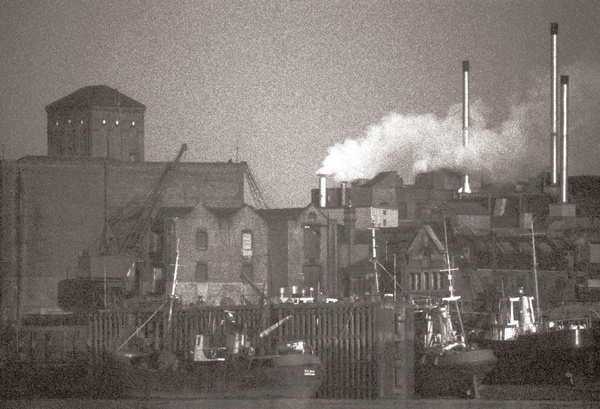 Very atmospheric photos – I did see it around this time when it was under threat. Hard to believe there is so little left! I should say in the 80′s rather than the 60′s! Stunning photographs. Because, as John mentioned, he did not take these pictures for documentary purposes, they have a real honesty about them and are not contrived in any way. I can almost smell and feel the atmosphere of a time I never knew. Wonderful photographs. Bring back so many memories long forgotten of time spent in London’s docks and on the Thames. 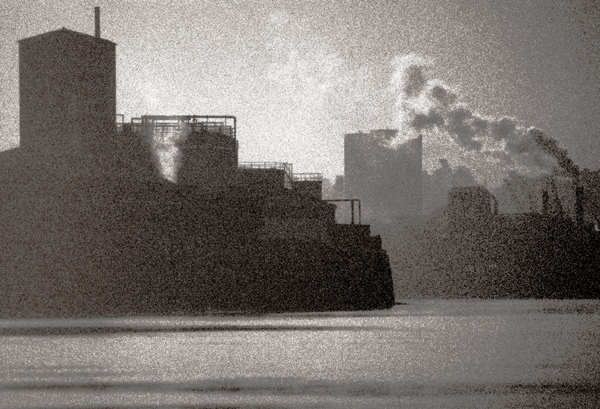 Wonderfully atmospheric photos, there is nothing quite like a working river. In the 20 years I worked in London I always liked it if I was in an office close to the Thames and at one point I was lucky enough to be right by it at Bankside; also, my late dad worked on the building of HMS Belfast as a young man, so another connection to it. I was born on the E Coast of Scotland, and it makes me need to be near water. I’m now back there a few minitus walk from the Forth, another great working river – I love looking at the oil tankers in the distance and the har coming in from the sea. For me the Thames was the next best thing to home. 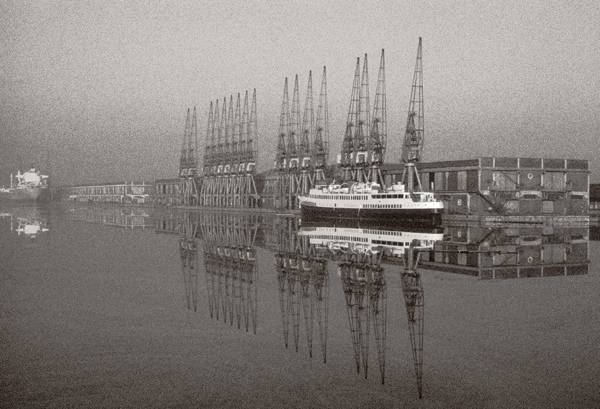 My personal favourite is the Silvertown 1964, cargo ship at dawn. So majestic. Can I buy a print of it? As ever with John he has captured something that we will never see, or feel again. life as it was in the East End not so long ago. Once again we get an insight into John Claridge’s world as a young man, it blows me away, the atmosphere of the pictures fills me with warmth and admiration for the photographer, someone who cares about their surroundings and at the same time have an urge to document it without reason, that’s what a great artist is made of, it’s not about recognition, it’s about heart and soul. In my mind John Claridge is the most purest and honest photographer, and I hope we get to see more of his images in the future. John’s images always display a beautiful understanding of light; being asymmetrical they tell us so much about the photographer. If I knew John, I would expect him to be unconventional and opinionated. I would love to share a drink with him- what a night! Haunting. Beautiful images, historically significant, I want to own copies. As always John, you never cease to amaze us! How you had the insight to capture this precious history while we were just taking pictures of our cars and girlfriends………………………..
late night here and I am truly blown away by the beauty of these images. Your beautiful, eloquent artworks rocket me back in time. off to the four corners, imaging that we were aboard, magic , until we were thrown off late. A magical time i thought was lost, you’ve brought it all flooding back, thank you. You have captured my memories. Beautiful images…….. and amazing how fast things have changed. You can smell the atmosphere in these images. Truly wonderful. amazing. i feel like i’m there. Thank you. This is my dads town, His Dad George Bert Allen had wet and dry fish shops in Silvertown. Bombed in the second world war. Grandma got the statutory £100 from the government, and promptly spent it down the pub. Great Photos, so glad you pushed the shutter button. Some pictures! 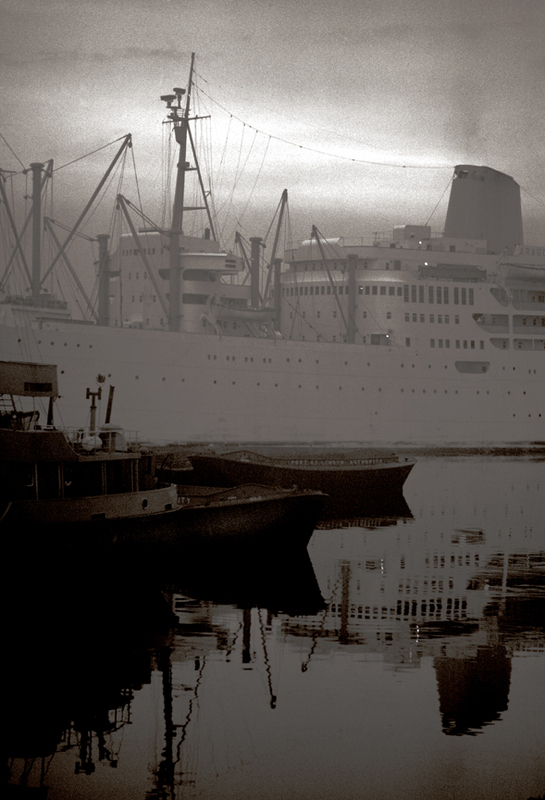 I used to walk down one side of the dock to sus out what ships were what,before going to the pool to sign on for a ship as an A.B seaman – this was in the fifties – ah happy days. such bleak photos – i think i would prefer their colour versions! any memories with me.It’s just stunning how much the world can change in one lifetime. than you ever knew existed…wonderful. There is little more I can say,as everyone else has said it!! but these are really stunning pictures John and having not seen them before they are all the more amazing and so wonderful as these scenes have all but gone in the dash to modernise our city. So very glad that you “climbed over the dock wall”. So many views of a past world, which Claridge has captured in such stunning, ethereal shots. Many thanks, John. Paintings of the life of the Thames. Black and white with a camera. Sometimes vague, but always beautifully sharp. Just great. 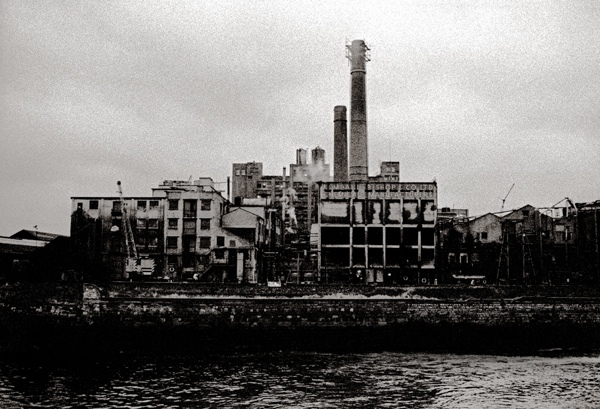 What a wonderful pageant of the former greatness of London’s docks . 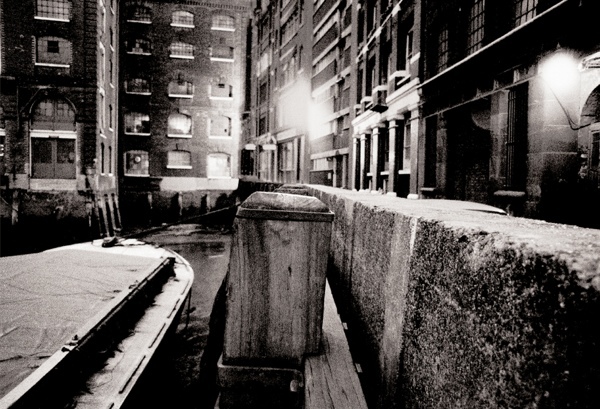 . .
is the genius that is John Claridge. Sums up ‘ The past is another country ‘ . 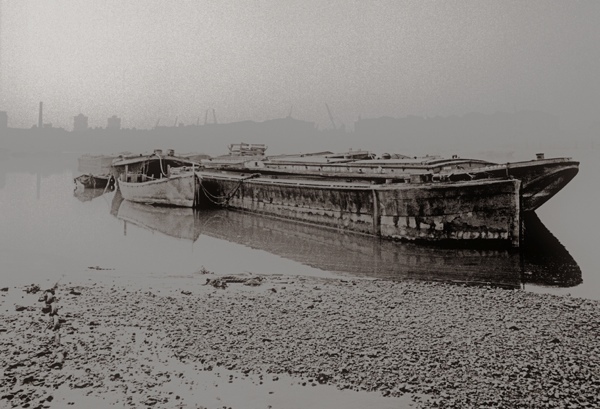 Very, very Old Father Thames smooth and silent as satin, and far naughtier, past the petrified forest of dock cranes, below which, battalions of three wise monkeys went about their monkey business.But, no more. Both river and cranes have witnessed God Knows What and have nothing to say that might incriminate as all, and they are without number, sins are washed away. Well hidden like a tarantula in a banana stem off an Elder Fyffe tub . The blankest silence, as the mirror shield of Perseus after he whacked Medusa and set Andromeda among the stars to look down on the everlasting snake of water below. by the Merchant Navy Pool office, down to Canning Town. Always at night and in the company of the late [ and great abstract artist ] Sandra Blow. Back with the dawn to Chelsea Reach.We both drew inspiration from those sooty ill lit walls and pale glitter of vast water. body. Great far off songs of Silence – Johnny me old lighterman. Well done again. It would be extremely difficult (impossible?) to find more than perfect examples of the quotation(coined by a famous artist) “painting with light”. Claridge,don’t ever put the brush down to rest! What wonderful haunting images. Beautifully composed photographs. Stunning. those were adventurous days. never new what new things you would discover. i spent my youth on that mighty river from its source to its estuary. 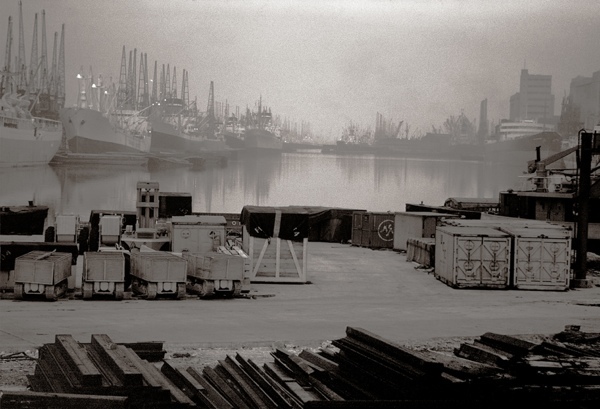 the docks were magic places, they were the window on the rest of the world with all the different cargoes and bustling tugs and ships, the cranes and wires and barrows trucks and the fee for the security to go thru the gate. so poignant to see those pictures, how the mighty are fallen. went back to visit last year. now it has risen again with mighty buildings and a throbbing heart a centre of finance totally modern and computerised. not my cup of tea, but still to be admired. fantastic mood changing photos, well done. Many thanks for the dock photos as they relived memories for me when I was a regular visitor,1952 till end of 1957, being Engineer on Rangitoto and finally 3rd on the Ruahine.The remark about the Connaught was amusing,wish they had Stippers in my times there. Went to the old dock area in 1995,didn,t recognise a thing apart from the river.Cheers,John. 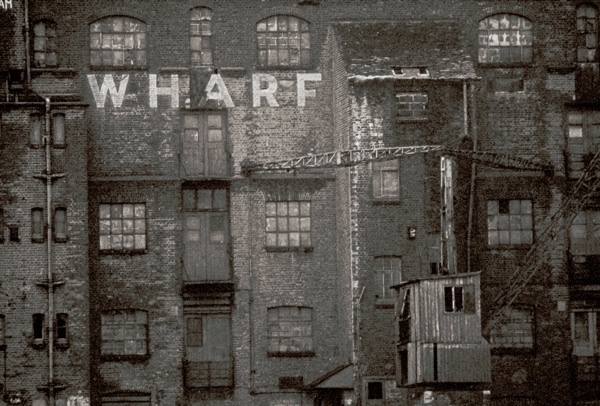 Back in the 1970′s, a very good friend of my parents took me and my sister on a tour around the old wharves of Wapping etc, before the boom of docklands development took hold. I was a young child, but that day is a vivid image that has been planted in my memory. I was fascinated by them and thought these derelict buildings were absolutely beautiful. They resonated with the history of what had gone before. I was sad to them redeveloped and the area lost all of its character. I would have wished them to stay empty but just vibrate with the past life they were so much an important part of. However, I know that that is an impossibility being such a prime piece of real estate! My god John! This series of images are just ASTOUNDING. The cranes are particularly sublime and oh so haunting. The prints are out of this world and perfectly compliment your masterly vision. I have nothing else to say; l am speechless. ps. sod the drink l owe you. I’m buying you the bottle; the crate; the whole bloody vineyard! Great photos. One correction. It is St. Katherine Docks not St. Catherine’s Dock, i.e. a K not a C, and s on the Docks not the Katherine. I walk by there every day, so it’s etched in my mind. I was able to see the house where I was brought up, which backed on to the canal in Stratford. Wonderful pictures of my playgrounds during the 1940′s, I recognise so many of the scenes — that long high brick wall leading to the Isle of Dogs, walking and half running with my parents and young brother to the River Police canteen where Mum worked at night, with what sounded like tin cans falling around (incendiary bombs), also the iconic buildings in Silvertown where my Dad worked in the Victoria and Albert Dock and later where Mum worked in Tate and Lyle, and remember all of the invasion landing craft with Pnos. on the bows in 1944 lined up ready to go. The Lights or barges by East India Dock Basin where believe it or not we would swim in Orchard Place, it was also a great experience to stand by one of the bridges when they swung around further along that high brick wall by the Isle of Dogs and watch these huge ships go through a space with just 12in. of space either side of it, rubbing along the old tyres hanging from the sides of the quay, in words of the young ”it was awesome”. What courage and fortitude our parents had during those years and what freedom their children had ! Thank you again John, those pictures bring it all back. — Michael Bacon. These photos are so evocative. 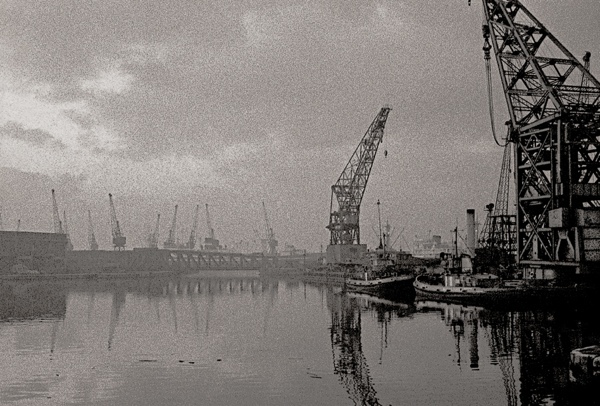 I worked for the PLA in Royal Victoria Dock from 1962 to 1967 so I remember all the locations. I was a clerical officer but was lucky to have worked at A berth in an office next to the shed foreman and saw first hand the unloading of beef from Argentina from Blue Star vessels Uruguay Star, Brasil Star, Argentina Star and the Paraguay Star which unfortunately caught fire in 1969 and was sent for scrap. Those days were magical. There wass something about the docks which was hard to explain. It was a world behind walls and gates which had both smells and sounds of their own. Looking at your pics has reminded me of those sensations. I hate what has replaced those places. Only revisited the area once and felt so sad. Wish I had the foresight to have taken my own photos. Glad you did.